This week's links to the books reviewed, cited or otherwise dealt with below, in the weekly roundelay sponsored by Patricia Abbott, continental wanderer particularly in cold months. Patti will be hosting again next week. Bill Pronzini and George Kelley (and Jeffrey Marks): People vs. Withers & Malone by Stuart Palmer and "Craig Rice"
2009 saw two rather clangorous anniversaries: the 60th anniversary of the founding of The Magazine of Fantasy and Science Fiction, and the half-century anniversary of the first broadcast of The Twilight Zone, which among other effects had inspired a magazine that offered a lot of good fiction and more in its run from 1981-1989; it also had a companion magazine, Night Cry, for a few years. F&SF editor and publisher Gordon Van Gelder and TZ magazine co-publisher, and widow of Rod Serling, Carol Serling decided to put together impressive, fat anthologies, his a retrospective on what his magazine had published, hers an anthology of new stories inspired by the series in some manner, that I've been meaning to review for some years, but haven't gotten around to reading...just dug them out from the stacks as I pack up my old apartment. But this won't stop me from making a few comments...perhaps it's also notable that both anthologies would have direct sequels, as they presumably did well enough and there was always room for more gems from the one magazine, and contributions to the issues of the other we weren't ever to see published (TZ the magazine was an OMNI-like gamble, on the part of Montcalm Publishing, most notable previously for the Penthouse competitor skin magazine Gallery, on publishing a magazine that touched on the fantasticated beyond solely sexual fantasy). 191 • The Women Men Don't See • (1973) • novelette by James Tiptree, Jr. 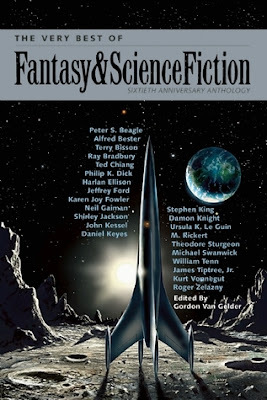 The first thing I'd note about the F&SF anthology is the mostly very sapient choices of stories...whether the almost necessary ones ("All Summer in a Day" from Bradbury, "Harrison Bergeron" from Vonnegut, "One Ordinary Day" from Shirley Jackson, and of course "Flowers for Algernon" from Keyes), but also such less compelled choices as "The Deathbird" from Ellison and "I See You" from Knight...and opting for a Zelazny other than "A Rose for Ecclesiastes"; the only real clunker in the bunch, I'd suggest, is "The Gunslinger" by Stephen King, which struck me on first reading as perhaps the worst story I'd read so far or at least certainly the worst by King (who had already come close at least a couple of times, as with "The Cat from Hell"). 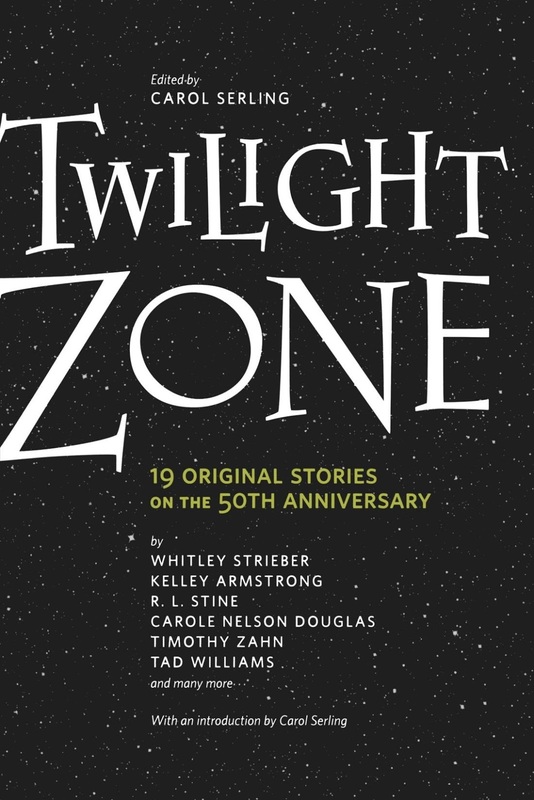 What I note about the TZ selection is that many of the best and most interesting (or even sustainedly commercial) writers are left off the front cover, which seems odd...and the only genuinely bad writer of the bunch, at least in my experience, is Whitley Strieber (even if I've yet to read a completely successful prose fiction by Rod Serling himself, either, as opposed to decent work in prose by his brother Robert)...but I'll have to get back to you to say whether the Karen Joy Fowler or Joe R. Lansdale stories are items they'll be remembered for. See below, for the small and not so small gems gathered (even when about items that aren't even good paste), and if I've missed your or someone else's useful and/or entertaining and insightful post, please let me know in comments. Thanks! Jack Seabrook: Alfred Hitchcock Presents: "Mail Order Prophet"
Jerry House: Private Snuffy Smith; TED Talks: "The Greatest TED Talk Ever Sold"
Patti Abbott: Seinfeld: "The Contest"
Paul Brazill: It's a Gift; Oh Mr. Porter! 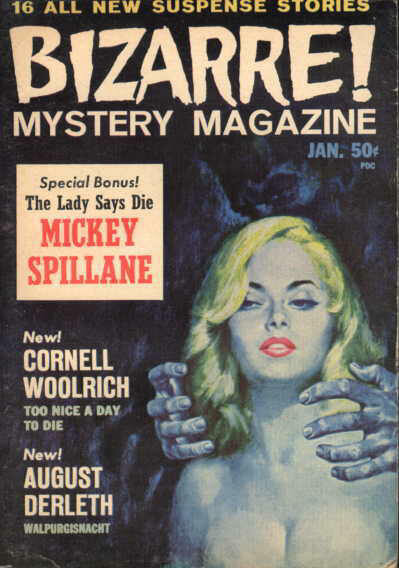 1960 was an odd year in fiction-magazine publishing, and a tough one. 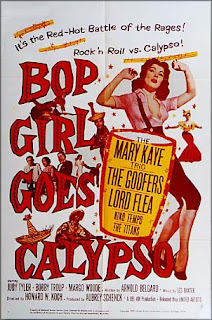 A number of interesting projects were launched--too often only to stumble and fall, or fold, after only a few issues; a number of venerable titles and publishing groups changed hands, settled in with new owners, or went out of business, or all three. 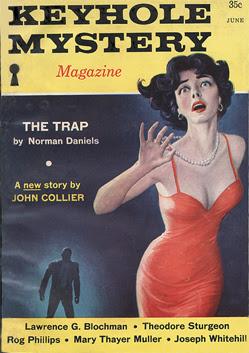 Three was often a magic number for the good new magazines of 1960, though Saul Bellow and partners' The Noble Savage got as far as five issues in two years, while New World Writing got a new publisher and slightly different format, and the major little magazine Accent ended its 20-year run; Pocket Books' adventure in magazine publishing, Ed McBain's Mystery Book, was among the three-issue titles, while one of the new TV-related fiction titles offered by Great American Publishing, Tightrope, saw four, with another, 77 Sunset Strip, getting out a single issue and their horror companion, Fear!, two. 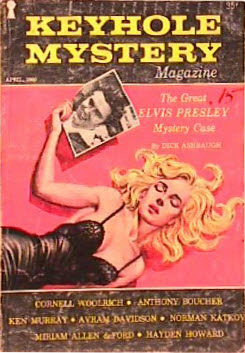 While The Saint Mystery Magazine was continued by another publisher, most of Great American's fiction magazines, including their newly-purchased Fantastic Universe (with a last issue featuring Robert Bloch, Fredric Brown and Jorge Luis Borges), were folded by the end of 1960, as were Columbia Publications' last titles: Double Action Western, Future Science Fiction, Double Action Detective (which had at the end featured a Edward Hoch "Simon Ark" story in every issue) and Science Fiction Stories (the last issue offering new work by Kate Wilhelm, Murray Leinster, Donald Westlake, A. Bertram Chandler and Donald Wollheim). And two interesting new magazines from a small publisher, Keyhole Mystery Magazine and Shock: The Magazine of Terrifying Tales, had their three-issue runs. Details supplied by Tom Lesser. 28 · Mr. Lupescu · Anthony Boucher · ss Weird Tales Sep 1945; Author’s Choice. 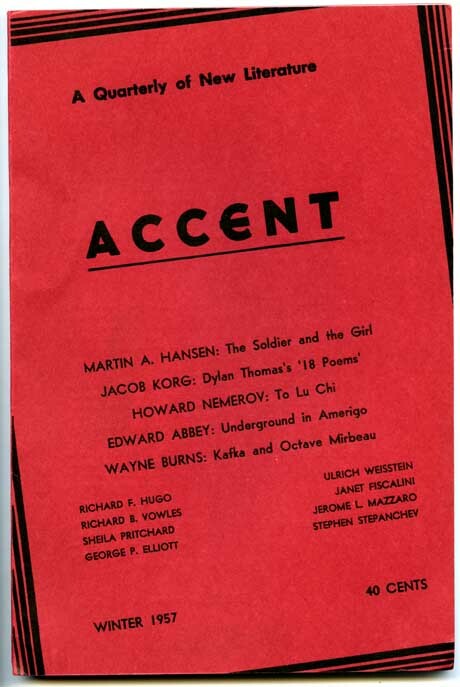 115 · A Kiss for Belinda [Dr. Daniel Webster Coffee] · Lawrence G. Blochman · nv Collier’s Feb 17 1951, as “Kiss of Kandahar”; given as by Laurence G. Blochman. If anything, an even better issue...at least in adding Bloch, Sturgeon and Collier originals along with another Davidson in the mix. And with the third and final Winston issue, deFord's back, and she and Bloch and Collier are joined by Roald Dahl, the busy Charles Boeckman, and then-new writer R. A. Lafferty--one has to wonder how new a George Kauffman item could be. A four year old Ellin reprint from EQMM seems a bit recent, but EQMM would do similar things...and it was Ellin (today is the anniversary of his death, oddly enough). Note also, still pinning hopes to a pop-music crossover appeal, with Fabian Forte, of all people, as a detective. 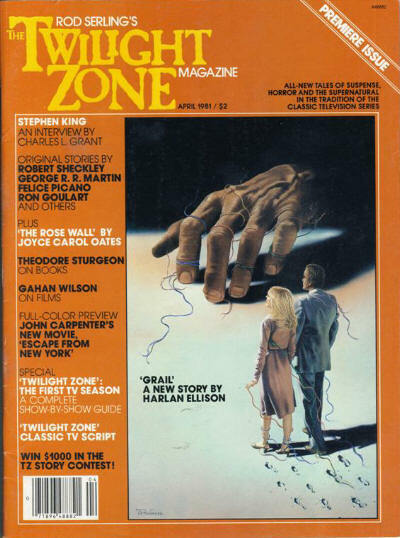 But, then again, there are worse things for young minds to be warped by than "Bianca's Hands"...the Davidson story was reprinted in F&SF a decade later, and a decade+ after that in Dennis Etchison's anthology Masters of Darkness III. Originals by Richard Matheson, Jim Thompson, Reginald Rose (12 Angry Men), and Davidson are nothing to dismiss out of hand, even if the Davidson is probably the closest to major work by its author. A young Lenny Kaye, a decade+ before starting to play with Patti Smith Group and putting together the Nuggets anthology albums of garage-rock and protopunk, wrote a published fan letter about this issue. Details supplied by Darren Heil. Originals by Davidson again, deFord, and Bloch again as "Will Folke"...one does get the sense that Dan Roberts, whoever he? was, definitely edited both Winston titles. 110 · The Kennel · Maurice Level · ss Hearst’s Magazine Aug 1920; translated from the French (“Le Chenil”, Le Journal, 1906). 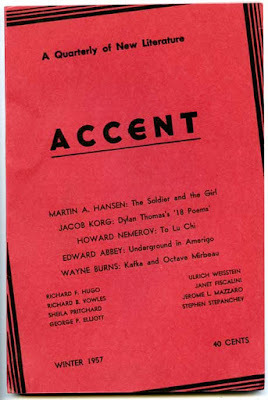 And the third and last Winston issue features originals by Edward Hoch, Lafferty, Westlake, and journeyman John Anthony West, among others...including one of the best stories of Bloch's career, "Final Performance," a story that is in more ways than one a hardboiled punch in the gut. And see the indices at Phil Stephenson-Payne's The Crime, Mystery, & Gangster Fiction Magazine Index, the source of the indices above and several of the cover images. For a sense of how these magazines went, try Peter Enfantino's reviews of the archetypal Web Detective. I wish I'd seen some of these on the stands. 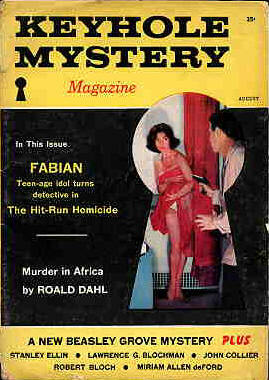 Any magazine featuring Fabian as a detective would have been a must-buy. Is Dan Roberts the same guy who wrote lots of western and romance paperbacks in the sixties and seventies? If so, his real name was William Edward Daniel Ross and he lived 1912-1995, writing lots of short stories for different mags. Oh Todd, I wish I had something of interest to say about your well researched and comprehensive post but I have never read any of this sort of thing in magazine form. 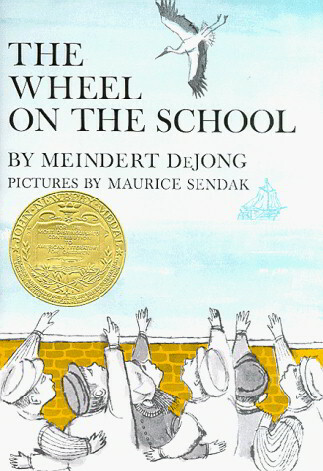 I know, I know, you probably consider this a shortcoming in my literary education - so be it. :) But all is not lost: I did recognize 11 of the authors listed. I am not completely beyond the pale. Well, Juri, is this the guy who was most probably best known in the 1960s for the DARK SHADOWS novels as by Marilyn Ross, and a GUINNESS BOOK record-holder for prolificacy? Probably. Have to wonder if he was faster than Barry Malzberg or more productive than Robert Silverberg or Lester Dent, but these magazines seem like a likely job for him to take on. Yvette, there is no lack of people who've never read a fiction magazine, nor even picked up one to check out some excellent illustration or see what a favorite writer was up to. You might enjoy the experience more than you think (you sure you haven't? )...and just don't tell Walker Martin, fellow northern Jerseyite, who might have to come by with several hundred examples for you to try...you can tell they fascinate me, but this FFMagazine post is perhaps the least popular, so far, that I've posted in a while, so perhaps I tax the readership. I discovered the crime digests about the same time I discovered the SF digests(1956). But as a teenager living on my small allowance, I could not afford all the SF magazines plus the crime magazines like MANHUNT, etc. 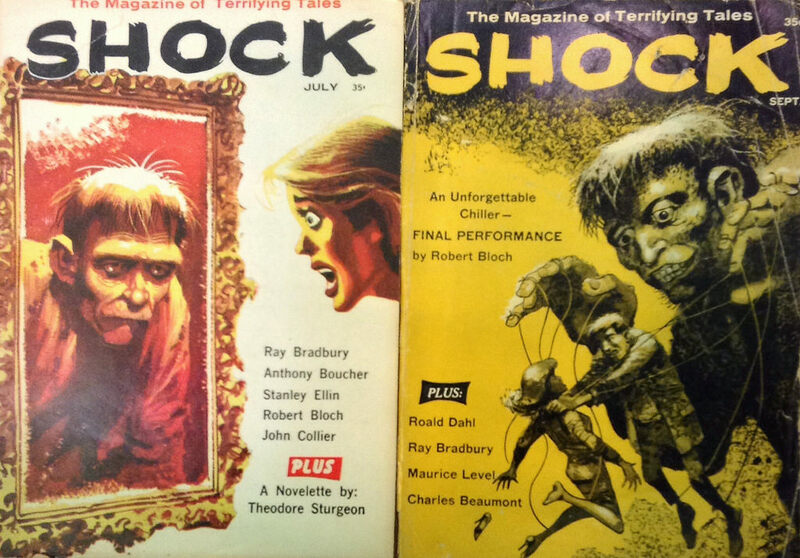 But many years later, I did start collecting MANHUNT and the many imitators. Then when I retired a few years ago, I figured I was finished with the crime stuff and sold them at Pulpcon. Turned out I was wrong and I started collecting them again! I picked up a set of MANHUNT which I've written about and at Windy City in April 2015 I bought over a hundred crime digests like TWO FISTED, OFF BEAT, SURE FIRE, etc. Then I bought another hundred when they were delivered at my home. Titles like GUILTY, TRAPPED, and PURSUIT. I have KEYHOLE and SHOCK (again!) and will hang on to these until the bitter end. Good article. I like Davidson's "The Tenant." 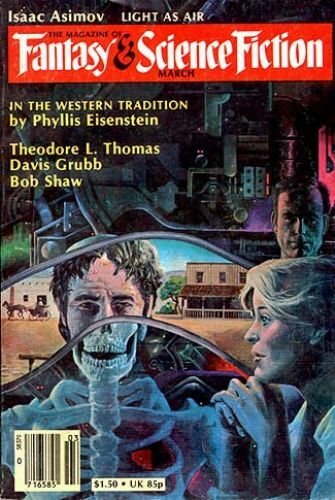 Interesting to note that its inclusion in the Etchison anthology was Davidson's own doing (the idea for the Masters of Darkness series is that the authors themselves select one of their own, lesser known yet personally liked stories). Had Davidson not been invited to the series, the story would until today remain un-printed outside its two magazine appearances. 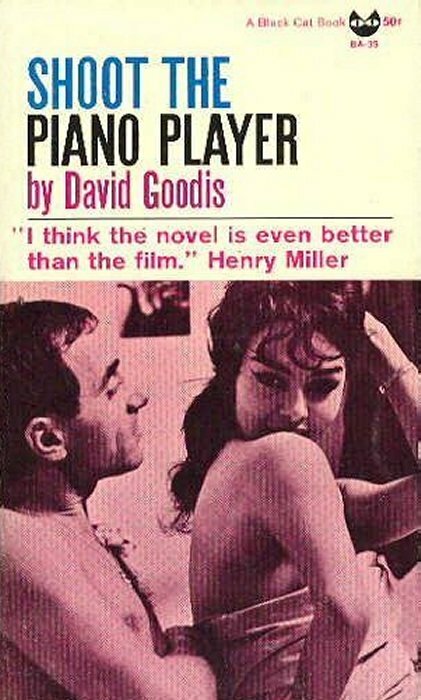 Frank: Yup (plus at least French translation in Fiction, the French correspondent to F&SF)...though perhaps that will change soon. Walker...have you made initial efforts toward placing your collection with a library or archive? And have you found much worth reading in,say, Off Beat? I'm still busy collecting and reading, so I haven't given much thought to placing it with a library or archive. My feelings now are more in line with placing the magazines and art with other collectors. MANHUNT is quite readable in the early and mid fifties and some of the other hardboiled crime digests are of interest also. But OFF BEAT, TWO FISTED, and some of the others are just about unreadable. They are collectible mainly because of the bizarre cover art. I've found this applies to many of the men's adventure magazines also. The Nazis and damsels in distress covers are outrageous and crazy but the fiction, or so called "articles", are hopeless. 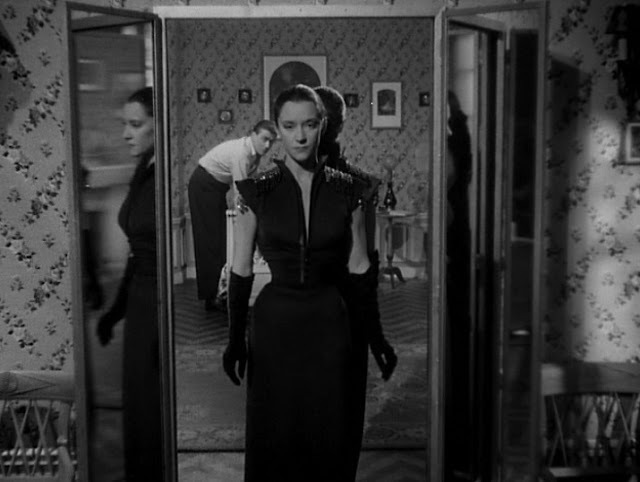 KEYHOLE and SHOCK didn't show up around here. I've never seen these covers before but I really like them! Walker, let me know when you want to start placing magazines and art with other collectors. I'm just a short drive away. 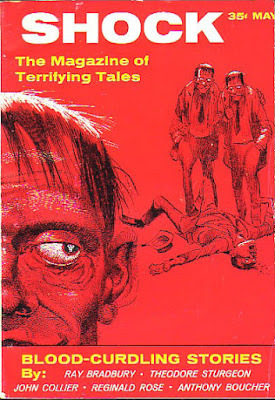 George, you can do worse than Emshwiller and Davis on their worst days...I wonder if Forte posed for the photo cover, or it was an image already at hand. Jack, many of us live in NJ, after all, or nearby...my worry about trying to place my collection, as George did his, with a university or similar, is if some idiot comes in and decides it's a lot of waste paper...much as might happen to a collector with unsympathetic or overwhelmed survivors. Or the kind of optimist who hopes against hope for a $150+ eBay sale on a single copy, if rare, of a Myron Fass issue, full of half-Fass fiction. At least the last might wise up. This is amazing stuff! What a great lineup of names! I am especially intrigued by the Saul Bellow connection, and I'll be digging further into that one. THE NOBLE SAVAGE published a best-of that is harder to find than issues of the magazine itself, RT...if you hit the link above, you'll see part of the reason the enterprise had some potholes on its road...and how those led pretty directly to Bellow's HERZOG.